This Wauquiez Amphitrite 43 is powered by a Perkins 4.154M 60hp diesel engine. With a 450 ltr diesel tank, at a speed of 3.2 knots she uses 1.6l/h. She features two alternators, and new cool and raw water pumps. Her Gearbox was completely overhauled 2016. This Ketch rigged Wauquiez Amphitrite 43 includes a full set of five foresails, and roller furler; Main sail; storm tri-sail, and mizzen. 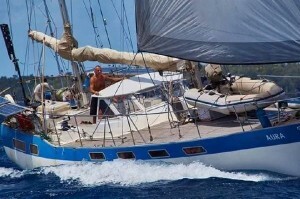 She also has two poles and ten sail winches. This Wauquiez Amphitrite 43 provides accommodation for a total of nine people. There are three cabins each with a double berth, and there are 3 further convertible berths in the saloon. There are also two bathrooms with heads and shower. The saloon on board this Wauquiez 43 features a spacious seating area with dining table, and a further bench sofa opposite. The galley has been recently refitted with new stainless steel sinks and countertops. The galley also includes a large fridge with freezer, water maker, pressurised water, salt water pump, and a Force 10 oven with new burners (2016). This Wauquiez Amphitrite 43 is equipped with a 6 person inflatable tender with a 6hp outboard engine. She also includes a Walker Bay sailing dinghy.